Just when I think it’s safe to say I’ve seen everything cute that there is to see out there in the world of mega cute, something lands in my inbox to remind me that there will always be something new – and cute – to make me gush and say awwwwww. Blabla have introduced beautiful bedding and decor accessories to their existing range of gorgeous wares. 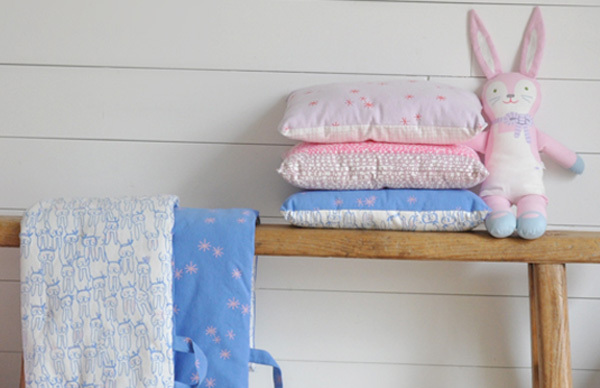 Travelling play pads (US$68) complete with handles for easy grab and go, pillows (US$24), comfy handkerchief beanbags (US$130) and handy for everything lunch totes (US$28) are all available in coordinating and reversible prints including blue stars, grey bunnies and purl pink. Best of all, they blend effortlessly with all the magnificent Blabla cushions we’ve featured previously. If I know someone is going to have a beautiful nursing chair in their nursery, I think the Cloud Pillow (US$62) is going to be my go-to baby shower gift. The cotton knit is gorgeous, the grey and white colour combo is sublime, not to mention bang on trend. 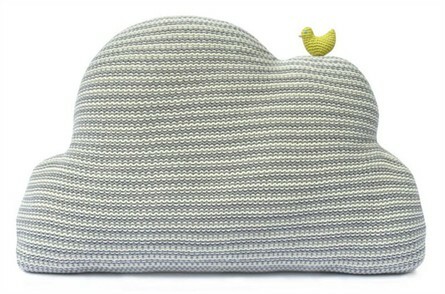 If that’s not enough to sway you, the cloud shape surely must… and did you see that teeny tiny little yellow bird? Be still my beating heart. So very cute indeed! Head on over to Blabla to see all that is new – coordinating your child’s space has never been easier either, Blabla very helpfully line up all their products in colour palettes to make decorating and shopping a breeze!